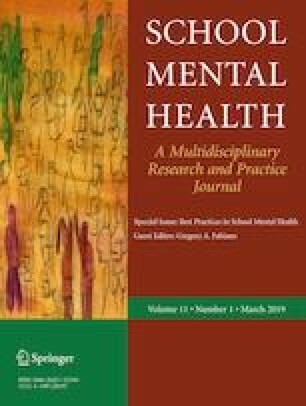 This study tested an integrated package for high-quality school mental health (SMH) services involving quality assessment and improvement, family engagement and empowerment, modular evidence-based practice, and implementation support. Within a two-year randomized controlled trial, 35 clinicians, who provided services to 529 students and their families, were randomly assigned to the enhanced quality assessment and improvement intervention condition and a comparison condition focused on promoting personal and staff wellness. Significant clinician-level findings were found for increased use and fidelity of evidence-based practices and greater use of structured assessments and sessions involving family members. Results are discussed in relation to needed methodological improvements in SMH treatment outcome research and increasing use of evidence-based practices by clinicians by adding accountability and incentives to training, coaching, and implementation support. We express our deep appreciation to the National Institute of Mental Health (NIMH) for the research grant supporting this study—Strengthening the Quality of School Mental Health Services (#R01MH0819141; 2010–2015, M. Weist, PI)—and NIMH project officers Beverly Pringle, and Denise Pintello for their guidance on this study. This publication also was made possible in part by Grant Number T32-GM081740 from NIH-NIGMS. Its contents are solely the responsibility of the authors and do not necessarily represent the official views of the NIGMS or NIH. Thanks are extended to Samantha Paggeot and Eryn Bergeron for their significant work as senior clinicians on the study, to the Waccamaw Center for Mental Health of the South Carolina Department of Mental Health, to the Horry County School District, and to Elaine Miller. This study was funded by the National Institute of Mental Health (#R01MH0819141).